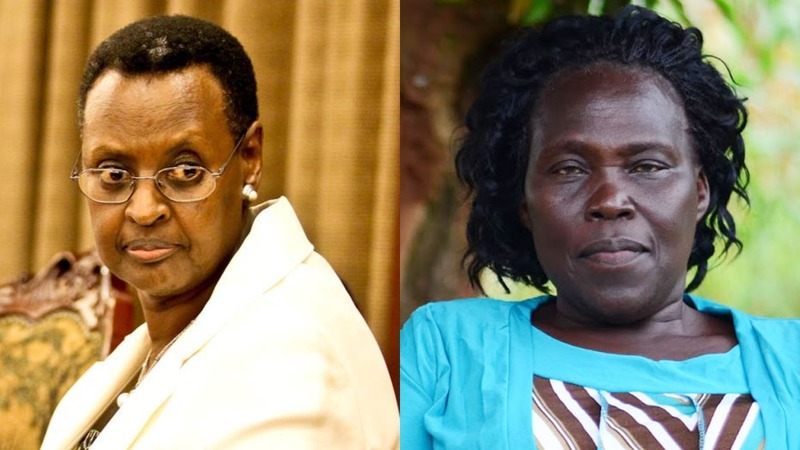 PARLIAMENT – Betty Aol, Leader of Opposition in Parliament has called for the resignation of Janet Museveni, the Minister of Education and Sports over the Rakai School fire that claimed lives of nine students and left others battling for their lives. Aol’s remarks were in response to a statement tabled by State Minister of Higher Education John Muyingo, who was briefing Parliament on investigations on fire that broke out and gutted the Senior Three (S.3) boys’ dormitory at St. Bernard’s Secondary School Mannya in Rakai district at around 1:30 Am. Speaker, Rebecca Kadaga informed MPs that they wouldn’t be in position to debate the report presented by Government, saying investigations are still ongoing and she wouldn’t be in position to control rhetoric of MPs. Kadaga also asked Aol to come to present her statement, where she said that the Opposition had joined the country to mourn with the families that have lost their children. Aol said that whereas parents take their children to school, it is disheartening for their children to come back with corpses which are unrecognized adding that the fires in Rakai are a common occurrence in Ugandan schools and within a short time, the Rakai fire will be history and it will be business as usual. It was then that Aol lashed out at Government for failing to make public all reports regarding the fires that have rocked schools in the country. “We haven’t been able to receive investigation reports, at least this investigation report should be for the public and probably for us to see the way forward for us to eradicate these fires, especially in schools,” Aol said. She then called for the resignation of Janet should her Ministry fail to make public reports on all the fires that have rocked the country. However, Aol was put to order by Sarah Babirye Youth Representative Central who attacked the Opposition leader for politicizing the fire issue. “As a youth member, most of the people who died are my fellow members and I know how it feels. Is it in order for a lady for that matter to politicize this issue that is affecting almost every Ugandan to make it a political issue so we can go ahead and censure politicians as if it is the First Lady that burnt the school,” Babirye said. The Youth MP was backed by Kadaga who reminded Aol that her duty was only to mourn the deceased students not apportion blame. In his statement, Muyingo said that preliminary reports indicate that the suspected cause of the fire was arson as per the details of the case reported to Mannya Police Post under SD REF 03l4lllll2018. Despite the varying figures of the victims, the Ministry put the deaths at nine dead students was, by yesterday, confirmed while a total of forty (40) students escaped with injuries, of varying degrees, and are hospitalized in various health facilities. The Ministry also sounded a warning to all Heads of education institutions, School Management Committees (SMCs) and Board of Governors (BoGs) reminding them to strictly observe and adhere to the Security Guidelines issued by the Inspector General of Police (IGP) for ensuring safety and security of lives of students/pupils. “In particular, measures should be taken to enhance their preparedness and capacity to respond to fire emergencies, including provision of fire extinguishers and firefighting skills for all members of the school community, including the students,” Muyingo said.